A dietary pattern with lots of edible mushrooms slows down aging processes in the brain, and reduces the risk of dementia. This is evident from a Japanese epidemiological study, which appeared in 2017 in the Journal of the American Geriatrics Society. The amino acid ergothioneine may explain the association discovered by the Japanese. Ergothioneine is an amino acid, mainly made by fungi. It is in small amounts present in the human diet. In the body ergothioneine is mainly present in the lens of the eye, but also in red blood cells, skin and kidneys. There are also indications that the substance delays mental aging processes and inhibit neurodegenerative disease. In test tube studies [Free Radic Biol Med. 2004 Feb 1;36(3):288-99.] and animal studies [Food Chem Toxicol. 2012 Nov;50(11):3902-11.] [Free Radic Res. 2014 Sep;48(9):1049-60.] ergothionein protects brain cells from aggressive substances such as beta-amyloid and D-galactose. So - does ergothioneine protect the brain from aging and chronic diseases? According to a Japanese epidemiological study, [J Am Geriatr Soc. 2017 Jul;65(7):1462-9.] which appeared in the Journal of the American Geriatrics Society in 2017, this might be the case. In that study, the researchers followed 13,230 people aged 65 and over 5.7 years. They looked at their intake of mushrooms and their chance of dementia. 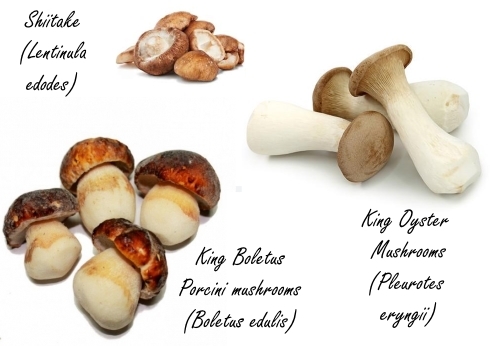 Mushrooms are the main source of ergothioneine in the human diet. The figure below comes from [FEBS Lett. 2018 Oct;592(20):3357-66.]. The more mushrooms the attendees ate each week, the smaller their chance of dementia. The differences in the figure below are statistically significant. J Am Geriatr Soc. 2017 Jul;65(7):1462-9. If you start a diet with extremely few carbohydrates at a young age, you may protect your brain against Alzheimer's disease and other forms of dementia. Italian researchers from the University of Milan come to this conclusion in an animal study, which has been published in Frontiers in Neurology. The aging process shrinks your brain, and this process causes the negative mental effects of aging - such as a decrease of memory and a decrease in the speed with which your brain solves problems.